Ford has been known throughout the past decade and a half for emblazoning their trucks with decals and assembling special edition option packages in an attempt to fill seemingly every niche in the pickup truck market. Editions like the Harley Davidson, Northwoods, King Ranch, Eddie Bauer, and countless others have appeared in showrooms in this fairly recent marketing phenomenon. "Steiger was a hot brand. The Steiger tractor was the first, most powerful and most reliable 4WD tractor in agriculture. 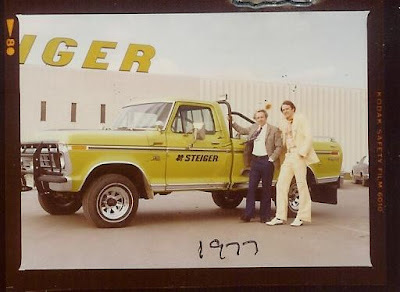 In the mid-70's Steiger was the biggest seller as well. The newly incorporated company, Steiger Tractor Inc., built a 420,000 square foot plant in Fargo, North Dakota to produce them in volume. Farmers in the great plains were the first to use Steigers, but by the mid-70's they were selling like hotcakes in the valleys of California, across the corn belt, among rice farmers in the Southeast US as well, in addition to making inroads in Australia, South America, and selected regions in Europe. The building in the background of the photographs you scanned of the Ford truck was the new Steiger plant in Fargo -- 10 acres under one roof. Crashing International Harvester, John Deere, Case, and Allis Charmers' choke-hold on the ag tractor market, Steiger's image and brand earned an image of strength and leadership among large farmers. We capitalized on that by promoting Steiger through "advertising specialties" as well as traditional magazine advertising, films, etc. I ran a Steiger store that sold shirts, belt buckles, caps, jackets, etc. to the tune of hundreds of thousands of dollars in sales per year to dealers and farmers. Since every farmer has a pickup, we extended that fever to pickup trucks too. We worked a deal through W.W. Wallwork, the Fargo-based Ford dealer (the biggest Ford dealership between Minneapolis MN and Spokane WA) to produce a special edition of Ford pickups sold exclusively through us. I believe they were produced for 2 to 3 years between 1976 and 1978 manufactured by the Ford truck plant in St. Paul Minnesota. 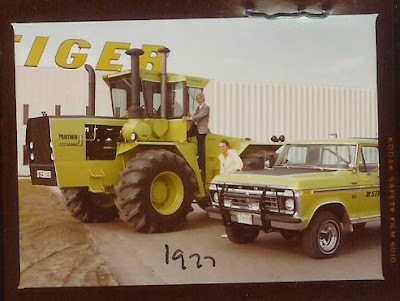 All were 4WD only of course, logoed and painted Steiger green, and well equipped with performance and comfort options. Several of them were owned by the Steiger company used around the plant and at Steiger Demo Day promotions following the grain harvest. Most found their way to Steiger dealers and Steiger farmer/owner/operators. I'd guess that there were about 50 of them made. My most memorable personal moment in a Steiger 4WD Ford F250 was during a heavy snowfall on a golf course under construction next to Buffalo River State Park near Hawley Minnesota. 4WD was relatively rare in trucks at the time, all of us being more used to rear-wheel power only with its quite different handling characteristics. On this particular weekend off, I was driving down a steep grade weaving among trees in axle-deep snow with the golf course builder (my friend Ron) when a huge Oak jumped into our path from the left through the blowing snow. The tree appeared so immediately, we thought we were toast despite the cold. I knew that hitting the brakes would destroy the tree, so being the tree-lover I am, I discarded that option. Time was so short that to hit the gas in that situation in my familiar 2WD Ford F250 would have meant the destruction of the left side of the truck rear of the front bumper. So hoping that 4WD in a pickup was all I had promoted it to be in a tractor, I hit the gas anyway and by-passed that pedestrian by a growth-ring. If it had been a year older, it would have tagged me good. As it was, the wheels bit, visibility went to zero with snow engulfing us, and the truck lurched right, square to the world, and we moved on with no abrupt halt as could reasonably be expected. No one at Steiger found out about it and I was able to keep my job." Thanks for the tip. There's a good chance that my Dad's memory is failing. I'll get back to him and update the article. Have you seen or know of any of the Stieger Edition Ford pickups that someone may want to sell? How ca We tell if we have a Steiger F250? Are there any Special Characters in the VIN?